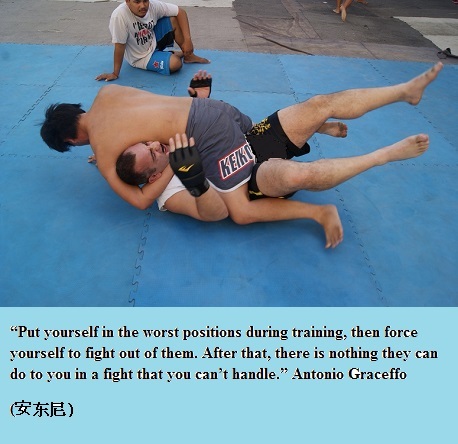 In his first year at Shanghai University of Sport, Brooklyn Monk Antonio Graceffo, a wrestling major, cross-trained in san da, but only practiced san da throws, because they were part of his research on Chinese wrestling. Now in his second year at the Sports University, he has begun working on his punching, doing up to 10 rounds of pad work each day. Coach Liu Xing has Antonio throwing combinations integrated with throws. Liu Xing believes having solid boxing will increase the likelihood of completing the takedown. On this edition of No Holds Barred, host Eddie Goldman once again spoke with the writer, web show host, MMA fighter, and wrestler, <a href="https://www.facebook.com/antonio.graceffo" target="_blank">Antonio Graceffo</a>. Born in Brooklyn, known as the "Brooklyn Monk", and raised in Tennessee, he has been living, training, and competing in several different countries in Asia for many years. 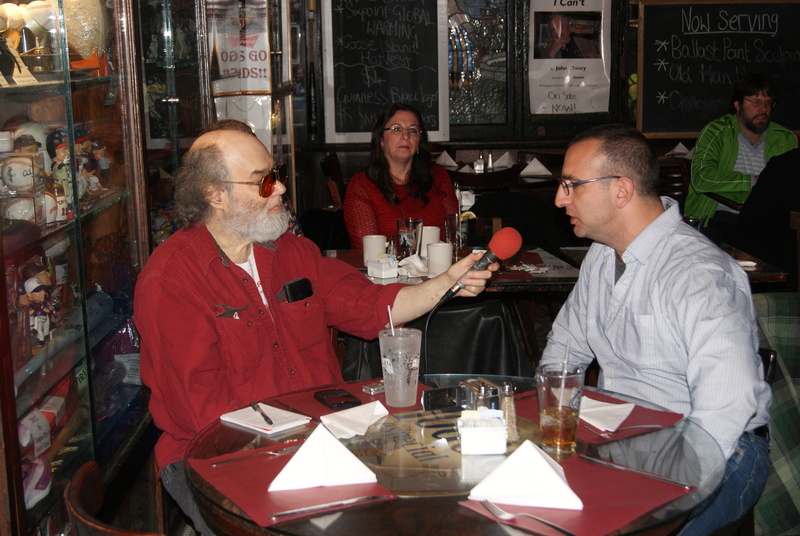 Now 46 years old, he has gone back to school, this time in Shanghai, China, to complete his Ph.D. We spoke with him Thursday at Foley's Bar and Restaurant in New York, while he was in town visiting with family members for the holidays. 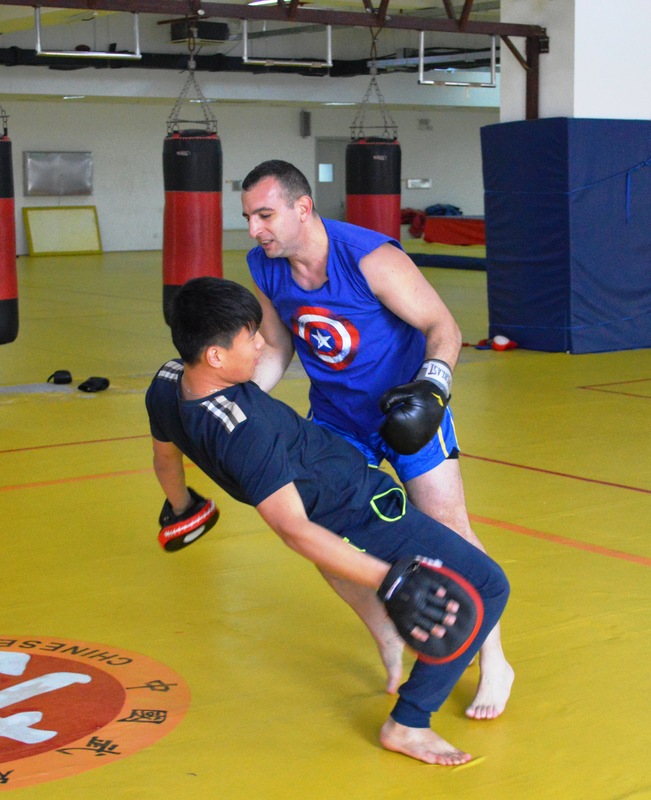 "I started doing a Ph.D. at Shanghai University of Sport, and I'm on the traditional wrestling team there," he said, referring to competing in the Chinese traditional style of wrestling known as Shuai Jiao, where the wrestlers wear jackets. "And I decided that I was going to take one year away from MMA fighting, just concentrate on improving my wrestling skills." Discussing his studies, he said, "For my Ph.D., I'm writing a dissertation on comparative forms of wrestling. 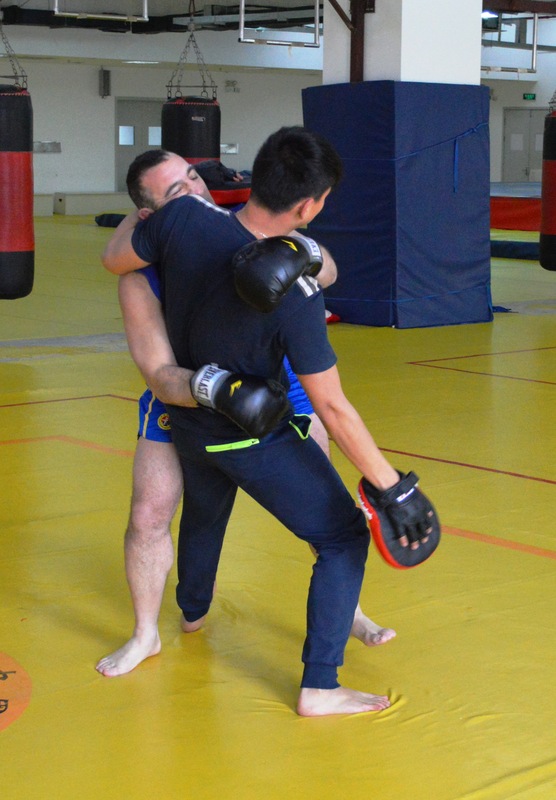 So within China, there's a number of traditional and ethnic forms of wrestling, and I'm also along the way writing scholarly articles for comparing wrestling with other sports, including MMA, sambo, judo, and so forth." While sports, including combat sports, have been booming in recent years in China, wrestlers from that country still often do not achieve much success on the international level. In addition, there are relatively few people in China training and competing in wrestling. "I think the key for China to improve in wrestling would be if they would promote the traditional wrestling more within China," he advised. Right now wrestling is mainly done in clubs, often involving people who work or go to school full-time. "Culturally, they could promote traditional wrestling to the Chinese people as a Chinese sport. From that pool of traditional wrestlers, they could probably begin to draw people and then train them in freestyle and Greco-Roman." He continued, "The strength and the weakness of Chinese sports in general is the system of sports schools, that they only have people at sports schools playing sports, and that kids in regular schools don't play sports." We also discussed his training and experiences at the Shaolin Temple, how prevailing attitudes have changed over the years in China to martial arts and combat sports, how the standup fighting style of Sanda is still very influential in China, the prospects for Wushu as a sport, why the issues of concussions and brain injuries in combat sports have not become major areas of controversy in China, learning the Chinese language, what is called Chinese food in America, and much, much more. You can play or download No Holds Barred <a href="http://nhbnews.podomatic.com/entry/2013-12-27T12_43_44-08_00" target="_blank">here</a> and <a href="https://archive.org/details/NoHoldsBarredAntonioGraceffoOnWrestlingInChina" target="_blank">here</a>. If one link does not work, please try another. No Holds Barred is also available on mobile phones and iPads through <a href="http://landing.stitcher.com/?vurl=noholdsbarred" target="_blank">Stitcher</a>. Also, No Holds Barred is available through <a href="http://phobos.apple.com/WebObjects/MZStore.woa/wa/viewPodcast?id=150801513&s=143441" target="_blank">iTunes</a>. “Martial Arts Odyssey” has been a web TV show for nearly three years, and 160 webisodes, spanning nine countries and countless martial arts. Now the web TV show is moving to an artfully edited DVD series edited by filmmaker, Charlie Armour and of course, starring Brooklyn Monk, Antonio Graceffo. “Martial Arts Odyssey: Volume One” will feature never before seen footage, interviews, and photos all shot on location, in the exotic world of Asian martial arts. In the war zone of Burma, Antonio Graceffo meets Mater Kawn Zanie, a legendary, undisputed master of Lai Tai, Shan Kung Fu, a soldier with decades of combat experience who often goes out on patrols armed only with Shan double swords, and no gun. The Shan have been fighting a defense war against genocide and oppression for more than forty years. Mater Kawn Zanie a veteran of countless battles said he training kept him alive. 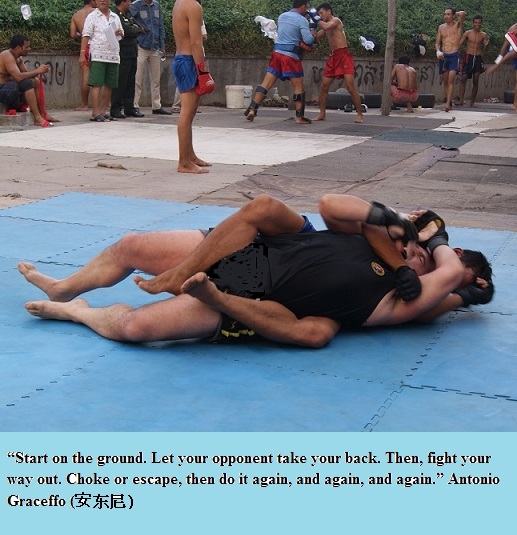 Antonio Graceffo is a martial arts and adventure author living in Asia. He is the host “Martial Arts Odyssey,” a web TV show which traces his ongoing journey through Asia, learning martial arts in various countries. This episode was edited by Antonio Garceffo and features the official Martial Arts Odyssey intro and outro by Andy To. 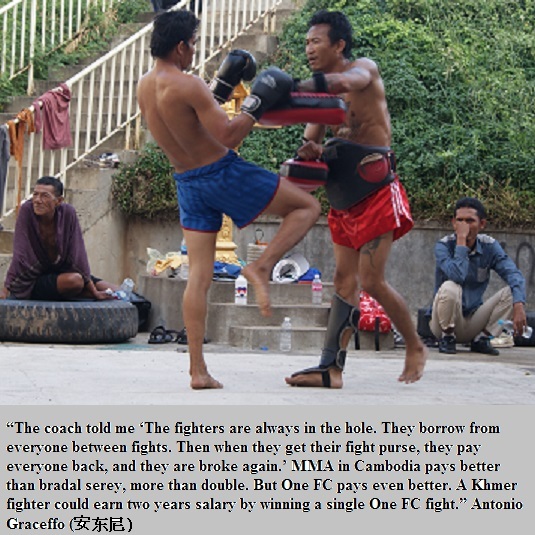 Host Antonio Graceffo, in the war zone of Burma, teaches practical military hand-to-hand fighting techniques to the soldiers of the Shan State Army, a rebel group, protecting the Shan people from genocide committed by the Burmese government. Practical fighting is a basic program of 18 strikes, beginning with the head, and working its way down, using each part of the body as a weapon. The system is very basic and easy for people to learn, even if they have no martial arts background at all. Using martial arts to educate the world about the plight of the Shan people of Burma. A lot of fight fans don’t get very involved with international politics. Hopefully featuring the Kung Fu of the Shan people will help call attention to the genocide in Burma. The art was almost lost in the Cambodian genocide, but it is making a comeback in Phnom Penh, thanks to the efforts of Grand Master San Kim Saen. 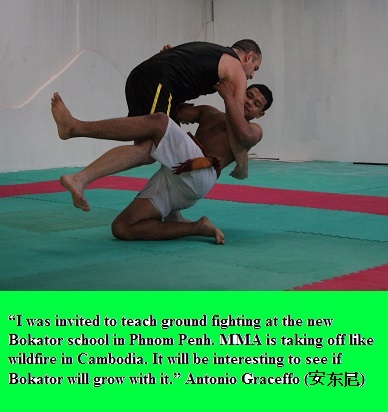 “Martial Arts Odyssey” host, Antonio Graceffo, was the first foreigner to ever train in or write about the Cambodian martial art, Khmer Bokator. Since his first story about the art appeared in “Black Belt Magazine,” five years ago, the art has been featured in various international TV shows and documentaries. Antonio’s own efforts to film the art and make it available to the world have been fraught with difficulties. The release of the full-length Bokator film he was involved in is two years behind schedule. The Six episodes of “Martial Arts Odyssey” he shot in Cambodia were done on a borrowed camera, in some strange HD format, which he has been unable to edit. This compilation video was done from various Bokator clips, filmed over a period of five years, combined with audio provided by a radio interview Antonio did with DJ Julian of Love FM in Phnom Penh, during the filming of the movie, “Brooklyn Bokator.” Viewers will get a real treat as they will see the Antonio get fat, get fit, get fat, and get fit again, as the video clips were shot over a period of years. This episode was edited by Antonio Garceffo and features the official Martial Arts Odyssey intro and outro by Andy To. Some of the video was shot by Tim Pek of Transparent Pictures, and it features a radio interview courtesy of DJ Julian and Love FM of Phnom Penh. David Calleja talks to Antonio Graceffo, host of web TV show, Martial Arts Odyssey, and leading kuntaw instructor Grandmaster Frank Ayocho. about the importance of history, culture and identity within lesser-known martial arts. It’s all about discovery. A show about the show.